This year my three-year-old and six-year-old sons both started school (pre-school and kindergarten, respectively). 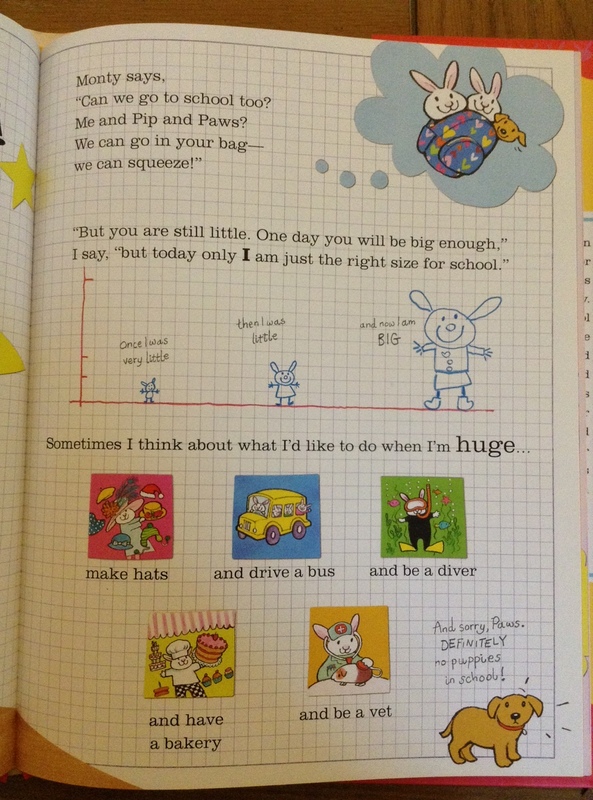 So the recent arrival of Clara Vulliamy’s Martha Bunny Loves School (Albert Whitman & Company, 2013) was quite timely. Martha Bunny Loves School is “a happy book all about Martha,” a bunny who is starting her first day of school. She has two bunny brothers (“one huge problem”), but before she gets to them, she shares her favorite color, popsicle flavor, hobbies, and (best of all) her “yellow-and-blue-and-orange-and-pink polka-dot rain boots,” which she wears even to sleep. Martha’s bunny brothers are going to miss her when she goes. After eating breakfast–her brother Monty will only “eat his breakfast inside his box”–and getting dressed (“I don’t know what to choose”), she has to mollify two sad brothers who don’t know what to do while she’s away. So she founds the “Happy Bunny Club,” complete with badges, a sign, and a secret den. After trying to fit all of her belongings into her backpack, Martha can’t fit through the door, so ends up packing just her Happy Bunny Club badge that her brothers make for her. At the end of her school day, she happily reunites with her brothers in the secret den. Martha have too much stuff in her backpack when she go, and she says, “SQUEEEEZE!” through the door. But her favorite stuff came out of the backpack. Not long after reading Martha Bunny Loves School, my son went off to draw his own Happy Bunny Club badge. The book aims at ages 4-7 (grades pre-school through 2nd). My 6-year-old thought he was too old for the book, but I don’t think he is. My three-year-old loved it, and older kids (especially with younger siblings) will appreciate it too. Martha Bunny Loves School is a standout children’s book, one of the best we’ve read in a while. (And we read a lot around here.) It’s been a pleasure to read through it with our little guy, and I’m sure we’ll continue to return to it in the coming weeks and months. Thanks to Albert Whitman & Company for the copy of the book to review. Its product page is here; at Amazon here. The author’s own site is worth checking out, too.